In 2016, all activities in the United States consumed 301 million British thermal units (Btu) of energy per person (per capita), a 1% decrease from the level in 2015 and the lowest level since 1967. However, total per capita energy consumption varies greatly among states and ranged from 176 million Btu in Rhode Island to 897 million Btu in Louisiana in 2016, according to recently released State Energy Data System estimates. In 2016, Rhode Island had the lowest per capita total energy consumption in the United States for the first time since 2012, surpassing New York. Rhode Island is one of the most densely populated states, and most of the state’s gross domestic product comes from relatively less energy-intensive commercial sector activities such as real estate, health care, and finance. Rhode Island consumes less energy per capita than the U.S. average in every sector—especially in the industrial sector, where it was 77% lower than the national average in 2016. Other states with low energy consumption per capita, such as New York (185 million Btu), Hawaii (198), California (199), and Connecticut (202), also have high population densities with fewer energy-intensive industries and commercial activities. Louisiana had the highest per capita total energy consumption in 2016, surpassing Wyoming, which was highest in 2015. Louisiana’s high per capita energy consumption is the result of a combination of its large industrial sector, which includes its energy-intensive chemical, petroleum, and natural gas industries, and its modest population size. Louisiana is the second-largest industrial sector energy consumer in the United States, behind Texas, and is the 25th most populous state. Although demand for air conditioning is high during the hot summers, heating demand is limited in the mild winters, and Louisiana's level of per capita energy consumption in the residential and commercial sectors are near the national average. Other states with high total per capita energy consumption, such as Wyoming (860 million Btu), Alaska (809), and North Dakota (776), also have large industrial energy sectors and small populations. 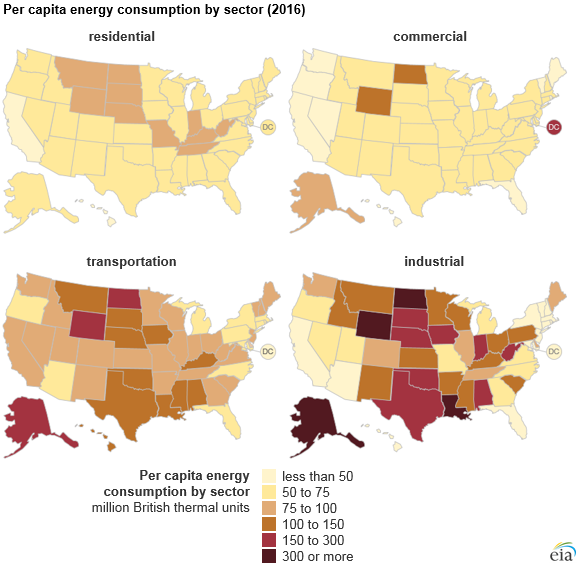 EIA calculates total per capita energy consumption as the sum of energy consumed in the four end-use sectors (commercial, industrial, residential, and transportation) divided by the total population. The largest energy consuming sectors are the industrial and transportation sectors, which accounted for 32% and 29%, respectively, of total U.S. energy consumption in 2016. The industrial sector includes energy-intensive activities such as chemical manufacturing, oil and natural gas refining, mining, construction, and agriculture. The residential and commercial sectors accounted for 21% and 18% of total energy consumption, respectively. Most of the energy use in these sectors is for space heating and cooling in homes and offices. In 2016, Louisiana also had the nation’s highest per capita industrial energy consumption (625 million Btu), while the District of Columbia had the lowest level (8.5 million Btu). Alaska had the nation’s highest per capita transportation energy consumption, which includes energy used for pipeline distributions (225 million Btu), while the District of Columbia had the lowest level (31 million Btu). The District of Columbia, with its many government and office buildings, had the highest per capita commercial energy consumption at 158 million Btu, which is nearly three times the national average. By comparison, Hawaii had the lowest commercial energy consumption per capita, at 29 million Btu. Hawaii also has had the lowest per capita residential energy consumption every year on record since 1960. Hawaii’s mild climate and highly concentrated populations along its island coasts lead to relatively little need for energy for heating and cooling buildings. North Dakota consumed the most energy per capita of any state in both the residential and commercial sectors with 89 million Btu and 113 million Btu, respectively. North Dakota’s small population and high demand for heating during cold winters contribute to the state’s high ranking in both sectors. However, the residential and commercial sectors combined account for only 26% of North Dakota’s end-use sector consumption. More than half of the state’s energy consumption occurs in the industrial sector, which includes its energy-intensive coal, natural gas, and petroleum industries, and results in North Dakota ranking fourth highest in per capita industrial consumption.